Just an interesting observation. There was a truck working on the sewers on this street. In the afternoon, people heading home and all that. Just look at the placement of the truck. One wheel on the bike lane but the bulk of the beast on the car lane. Cars were forced to slow down considerably while passing the truck. The bicycles, however, while having to slow down in this exceptional circumstance, were given free passage. As mentioned before, when you get to high levels of bike usage - this street has about 10,000 a day - it is imperative that the bicycles are allowed to continuing flowing. Just as in winter the bike lanes are cleared of snow before the roads, it's the same in a situation like this, above. If you stop the flow you create an irritating situation for cyclists and pedestrians alike, as well as risking having cyclists dodge out into traffic to get past the obstruction. 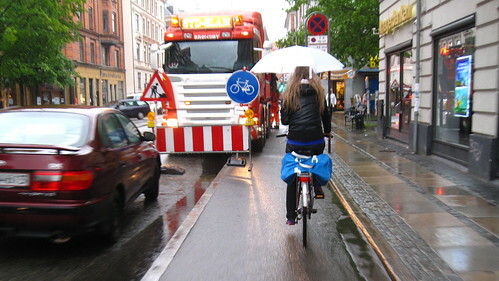 When cities implement bicycle lanes [or cycle tracks if you want to call them that] it is imperative that said city enforces the no blocking/parking/anything but bicycles rule. It is actually illegal to block the bicycle lanes. Blogged this one before but it's a good example of how a sign for cars about roadworks ahead is placed over the bike lane, so as not to block it. 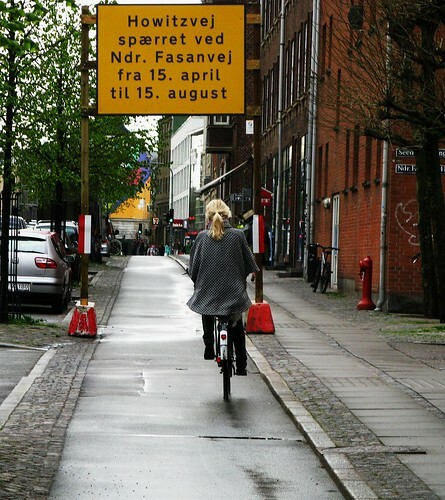 I think I rode under that sign for two weeks before actually reading what it said because there are never - or extremely rarely - roadworks that shut off streets to bicycles in Copenhagen. No roadworks here. 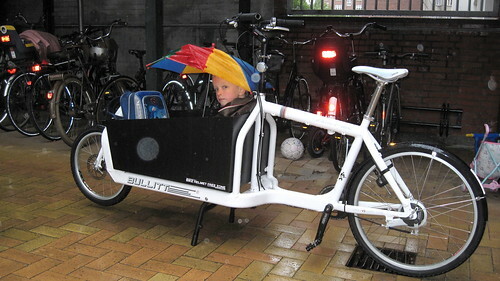 Just my boy Felix in the Bullitt, having just arrived home from a friend's place on a rainy day. He sat happily under his brolley while Daddy-o rode home in the rain. Lucky boy.